Spent most of the afternoon making embutido with my sister. Takes a lot of time to prepare the ingredients, then about an hour to steam the embutido. Nothing tricky about it though. In a bowl, combine all the chopped ingredients and mix until well blended. Leave the slices and strips for now. Spread and flatten the mixture onto the center of each foil. Divide the slices of hard cook eggs and strips of Vienna sausages and cheese. Place another layer of the mixture on top. Roll the aluminum foil into a tightly packed log about 1" to 2" in diameter, sealing on both ends. Repeat with the remaining pork mixture. Place the embutido in a steamer and steam for an hour. Remove from steamer. Let it cool and slice into rings. 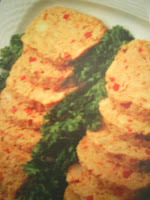 Alternatively, you can also fry the embutido slices. Serve with your favorite catsup or sauces.